Apply to be a writing tutor! This page features press coverage in English. Please see Swedish press here. "These four lifestyle changes will do more to combat climate change than anything else." IFL Science, Robin Andrews. 13 July 2017. "What you can actually do to fight climate change, according to science." Maddie Stone, Gizmodo. 14 July 2017. "Want to fight climate change? Have fewer children." Damian Carrington, The Guardian, 12 July 2017. "Move Over Rosé, Climate Change Will Mean New Wines." Earther magazine, Maddie Stone. 3 January 2018. "Resurrecting Ancient Wines That Can Survive Climate Change." The Atlantic. Matthew Sedacca, 17 July 2017. 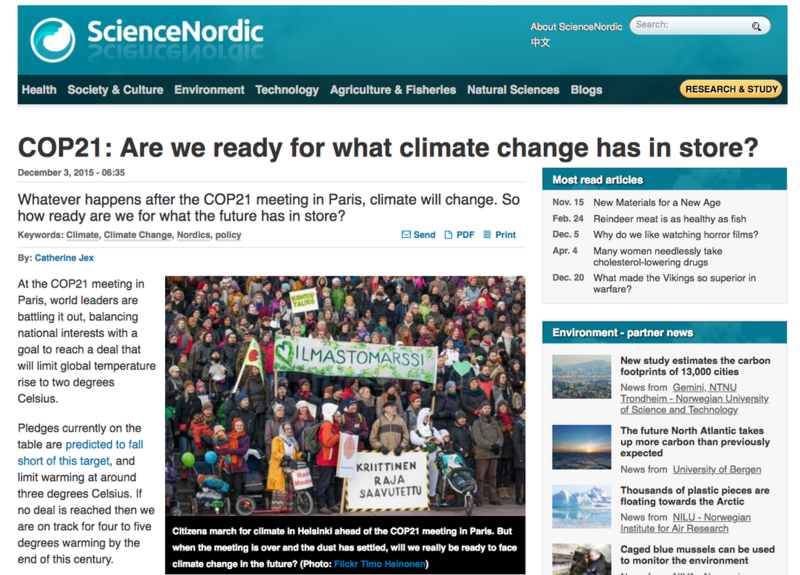 "Changing Climate: The Science." Interview with Roger Harriban on BBC Radio 4 as part of documentary series. Full interview and transcript here. November 2015. James Hansen's legacy: Scientists reflect on climate change in 1988, 2018, and 2048. Eric Holthaus, Grist. 22 June 2018. ​"COPtails: The night in pictures." I spoke to students about the structure and goals of the UN climate process in advance of COP22. "Foreign "land grabs" redraw global map of farmland ownership." Chris Arsenault, Reuters Foundation. 28 November 2014. "Why Wall Street investors and Chinese firms are buying farmland all over the world." Brad Plumer, Vox. 15 May 2015. Our work on global land trades (land grabbing) has been covered by media including the Washington Post, Environmental Research Web, Vox, Reuters, and phys.org. "What you eat is more important than where it is grown". Noomi Egan, May 2017. Crop yields and climate change. "Her Study Said Having Kids Is Bad for the Environment. Then the Internet Came for Her." Kristina Johnson, Elle Magazine (US). April 2018. "Tales of trying to fly less." Michelle Kovacevic, Medium. 23 January 2017. "Meet the science revolutionaries quietly changing the world." Genna Buck, Toronto Metro, 20 January 2017. "Working for a healthy planet." Nina Nordh, Lund University Magazine, February 2016. "Mobilizing for Sustainability." Michelle Kovacevic, Future Earth. October 2016. "Five reasons why we need scientists to make the Paris Agreement a success." Claudia Delpero, Road to Paris. April 22, 2016. "Approaches to a post-COP21 world." Jack Fraser, Lund University Sustainability Forum. 8 December 2015. "10 things I wish I'd known 10 years ago." Podcast for Early Career Researchers, made by Ina Möller for the Earth System Governance network. The best advice I've gotten and reflections on impostor syndrome, work-life balance, and more. "Celebrating Academic Failure." Postdoc training webinar, June 2018. "Sustainability in education at Lund University." Noomi Egan, October 2017.